What are Bamboo Pillows Really Made of? Bamboo has recently taken over the bedding market, but why? But are bamboo pillows comfortable enough to be worth it? How are bamboo fibers made? Is Rayon The Same as Bamboo? Are bamboo neck pillows organic? Why are bamboo products for sale everywhere? How much do bamboo pillows cost? They’re advertised as a natural luxury-class pillow yielding a miracle sleep, but are these pillows truly a cool, healthy, sustainable, comfortable alternative to conventional pillows? To answer this question, we first have to understand the makeup of… a pillow. And luckily for you and I, pillows aren’t very complicated. Bamboo, rayon or blends of all of these. That’s because bamboo isn’t a pillow filling at all. The bamboo portion of your pillow is only in the cover, not the stuffing. Because it’s true, those bamboo pillows seen on TV and sold to shoppers in local retail stores like Walmart and Costco aren’t really bamboo pillows at all. They’re glorified cotton pillows wrapped in a bamboo cover, marked up to fool tired shoppers desperate for a better night’s sleep. After sleeping on their new bamboo-foam pillow that was advertised as the “miracle for sleep” for a few nights, shoppers quickly realize that it isn’t as helpful or supportive as the salesperson promised it would be. At that point, they look up the reviews online, do their research, and find out that only 10% of the pillow is actually bamboo, while the other 90-plus-percent is generally an overly-processed cotton that’s filled with chemicals. The benefits start to fade as these cons are revealed. When you picture a pillow made from bamboo, you may visualize a luxurious block of memory foam surrounded by green leafy bamboo shoots and pandas, lots of pandas. Now that we know this isn’t the case, it’s worth exploring whether these pillows are comfortable and worth your investment. But first, let’s dive into how bamboo pillows err, bamboo covers are manufactured from a course-feeling “shoots” into silky-smooth fabric. After looking at this photo of bamboo stalks, do you think bamboo is a tree or a grass? Even though bamboo looks like a wooden tree, it’s actually what’s known as a woody grass. Scientifically, it’s classified as a member of the bambusoidae family. The bambusoidae family is a sub-family of the poaceae family, which is just a fancy word for grass. Bambusoidae grows quickly like grass, but to heights as tall as a tree. Much like the rubber trees harvested to make the latex foam used in our shredded latex pillows, bambusoidae trees can be grown, cut, harvested, then grown again. According to the Clemson University in South Carolina, there are over 1,200 different species of bambusoide. And though species can be slower growers, the types of shoots that are eventually harvested to make the bamboo pillow you see on TV can grow as fast as 3 feet per day! This rapid-growth of the trees make bamboo seem like a sustainable bedding product, however, this is not the case. 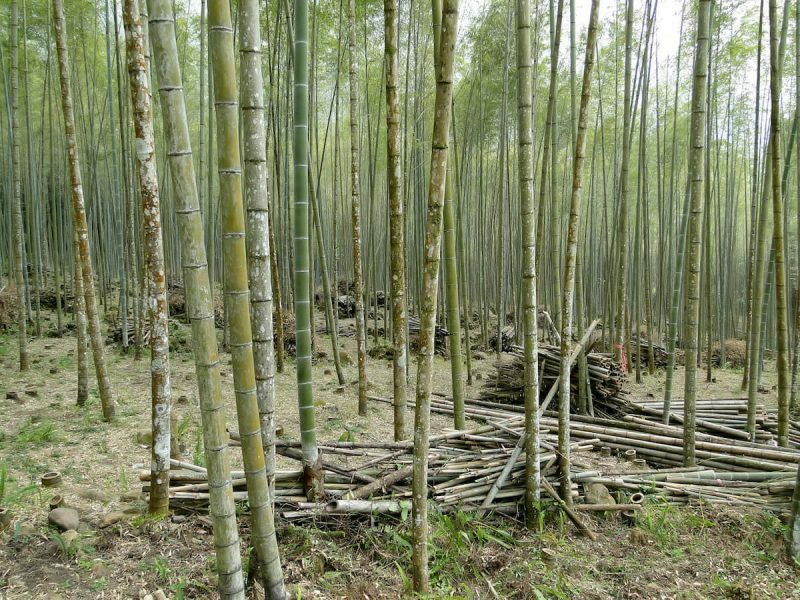 The way bamboo fibers are manufactured make products made from the bambusoidae fibers quite the opposite of sustainable. Bamboo is abundant and fast growing, which is a big reason it seems to have a low environmental footprint. However, what was once your panda’s favorite snack doesn’t magically turn those bedding products you’re researching easily! Because the raw product is innately stiff and rough, the manufacturing process is labor intensive and requires lots of chemicals to create any finished product worth selling. Pillow companies will tout this kind of pillow as sustainable and earth friendly. It’s easy to describe bamboo material this way because the material itself is sustainable before manufacturing begins. However, the end product is far from green when you consider the process required to spin the yarn needed for a bamboo-based pillow cover. Below is a diagram and explanation of how bamboo is turned into “viscose rayon”. And before moving forward, it’s important to note that (all things considered) this process takes more energy and uses more chemicals than need for manufacturing cotton pillows. 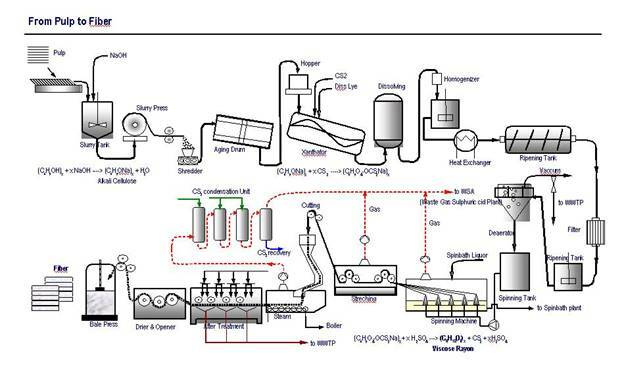 Looks pretty complicated, eh? Don’t worry, we’ll simplify it for you before moving on to more important cost, comfort, and ethical concerns. At this point the bamboo is still in form of an all-natural pulp, organic and IS sustainable. However, this is the last time you’ll be able to use the terms natural, organic, and bamboo in the same sentence. Why? Once the pulp starts being pressed, a variety of chemicals and bleaches are added, causing the end product to be classified as a “semi-synthetic” material. It’s not straight from nature any more, but also not fully made by chemical synthesis. It’s like a panda mixed with a robot: a pandabot. It’s also important to note that this semi-synthetic material is no longer bamboo at all, it’s now viscose rayon, or “rayon” for short. Doesn’t semi-synthetic viscose rayon pillow have a nice ring to it? To create viscose rayon yarn, the plant is steamed, crushed, then soaked in sodium hydroxide. After that, the pulp cellulose is pushed through a sieve-like tool that helps harden the pulp in preparation for the next two steps: first spinning into thread, then more spinning into yarn fabrics. This is just a basic review of the manufacturing process. And instead of further focusing on the complexities of rayon manufacturing, we’re going to highlight the portions of this process that you may want to consider when choosing the right neck pillow. What you may have believed to be a 100% bamboo pillow turned out to be about 10% of a pillow cover. Now we see that that the even the pillow cover is not bamboo at all, but a material called rayon. The rayon used in these pillow covers is so far removed from the bamboo plant itself that companies such as Target, Walmart and Amazon have received warnings from the Federal Trade Commission for mislabeling their products and misleading consumers about bamboo in household products. According the the FTC, bamboo and rayon are not the same. But what about that organic bamboo pillow for sale I’m seeing online? The bamboo pillow scam became so widespread that the FTC finally instituted a law regarding bamboo textiles. The regulation makes it illegal to label textiles made from rayon (a.k.a viscose rayon) as organic. Many retailers have been sued for not complying with these regulations, which were put in place to protect unknowing shoppers from being scammed. Wait, what? Companies are getting sued over using phrases like that use bamboo to describe bedding like sheets, pillows, and pajamas?! Why yes, yes they are – and for your benefit! Remember the chemicals used in viscose rayon manufacturing we mentioned? They’re toxic! And although there are many chemicals used, let’s take a look at carbon disulfide. These dispersant effects make the end result a notable danger for both factory workers and the environment. Does this sound like a material you’d like to lay your head on at night? Bamboo shoots can grow up to four feet a day, making it the world’s fastest growing plant. Supply and demand means the abundant supply of these shoots will lower the cost of the material that comes from them, right? In this case, it’s the bambusoide pulp. Next, pillow companies process this readily available bamboo into rayon yarn by using equally cheap (but toxic) chemicals. The result is a marketplace flooded with uncontrollable amounts of toxic rayon yarn, which is then marketed as bamboo. As shoppers, it’s hard not to think of the word bamboo without picture happy pandas in a completely natural setting, munching away on the plant. And that’s what makes selling expensive bamboo pillows disguised as a natural alternative to regular neck pillows so easy for pillow companies with questionable ethics. Because processed rayon is so cheap to create, the resulting pillows should be very low cost. However, the true cost of a bamboo pillow is between $30 and $150. But if we can agree that they’re made from cheap and abundantly available materials, why do they have such a high price tag? Because they’re falsely framed as a natural bedding product, pillow companies can charge more for their chemical-filled rayon pillows and sheets. This spread of false information is easier when the companies freely print “natural bamboo” on the tags of their rayon sheets and pillows. In the end, what’s just a glorified rayon pillow cover is now price in the same range as a truly organic neck pillow (until the law catches up to them and litigation papers are served, that is). When you’re looking for a new product that you hope will help improve your sleep quality and feel more refreshed, there are many product-related questions that may arise. There are pillow product reviews easily accessible online, but as we put this article to bed, we aim to be helpful for shoppers who still may be interested in these products. What are bamboo pillows filled with? For many sleepers, a cool pillow is the ultimate comfort for a perfect night’s sleep. A well-constructed rayon fabric has tiny holes that allow airflow and for heat to escape. But the fabric doesn’t do a great job of wicking moisture, which means it more easily absorbs bodily fluids. For some, this can make the pillow a little hotter than expected and renders the claim of a miracle cooling bamboo pillow false. If you’re want the best cooling pillow out there, we don’t recommend choosing an alternative more natural alternative. Are they good for neck pain? Because these neck pillows are nothing but a cover, whether they’re good or bad for neck pain depends on the filling. Another big factor is the type of sleeper you are. If you have neck pain at night and are a side sleeper, you’ll want a pillow with a high loft that fills the space between your neck and shoulders. If you’re a stomach or back sleeper, you’ll want a lower loft pillow that doesn’t tilt your head at an unnatural angle. Bamboo pillows are neither good nor bad for sleepers with neck pain. If you’re set on bamboo for your pillow covering, you’ll need to choose a pillow filling and loft level that fits your sleeper style. Doing so is the only way to help prevent pain and fatigue caused by tossing and turning because you don’t have the right pillow under your neck. Memory foam filled pillows wrapped in a rayon cover are sometimes touted as beneficial for snoring prevention. And much like whether bamboo pillows are comfortable or not, the effectiveness of memory foam as a cure for snoring highly depends the filling material, overall quality, and the individual sleeper’s needs. Shameless plug: our shredded latex pillow is 100% customizable and if you have problems with snoring, you can adjust the fill to help alleviate your symptoms. More resistant to dust mites? No, they are not hypoallergenic. Finding claims about the existence of hypoallergenic bamboo pillows online is easy, but don’t believe it! Because anti-allergy terms like “hypoallergenic” aren’t always included in federal guidelines for product labeling, they can be controversial and confusing to consumers looking for relief. But if you’ve learned anything in this article, let it be that that fly-by-night bamboo pillow companies will do whatever possible to sell you, your friends, and your family their product. Sensational claims like “this will cure your allergies” should be ignored. Why does my new bamboo pillow smell bad? Your bamboo pillow smells because of the off-gassing of chemicals, such as polyurethane, that were included as either a part of your pillow or as a chemical in the manufacturing process. This smell won’t last forever, but it’s important to understand the stink. The real reason for the smell is the likely toxic chemicals, which will still be hidden in your pillow even after the small dissipates. Some reviews state that flipping your pillow before you go to bed each night helps alleviate the smell. With a cover made from sustainable organic cotton, you won’t have to worry about sleeping directly on any harmful chemicals like you would with a bamboo-style cover. However, the best part of the pillow (the part our customers love) is the filling. Your Sleeping Organic pillow will come filled with extra latex shred because we want to give you the option to remove as much as needed to match your sleep style. Back sleepers need a low loft (less filling) pillow so their heads don’t rest at an uncomfortable angle during the night. Alternatively, side sleepers need a high loft (more filling) pillow that helps fill the space between the side of their head, shoulder and pillow. For side sleepers, not having this gap filled means their head will be tilted downwards at night, which is the the opposite of what a back sleeper experiences when sleeping with the wrong pillow. Many pillows marketed as bamboo are truly memory foam pillows and though many great memory foam options exist, they don’t allow for customization because the foam itself cannot be altered. Depending on how you sleep, you can add or remove latex shred from the pillow to establish a base pillow loft height. Then during any single night of sleep, you can move around the pillow’s shred depending on your individual needs for that night. One pillow, unlimited customization, guaranteed comfort. It’s a healthy pillow we guarantee you’ll love. Thanks for taking time to read this article about what bamboo pillows are really made of. We hope you found the answers you were looking for and now know not only the alternative products to consider buying, but also how to determine whether those neck pillows are truly natural bedding products.